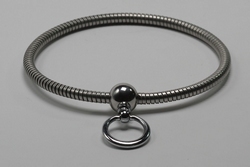 Necklace made of flexible stainless steel, closed by a ball with ring with a magnetic locking system inside. The ball is a separate item and can be changed by balls with other shapes. The diameter of the flexible necklace is approx 9 mm. The ball is approx. 22 mm diameter and solid stainless steel and the ring is about 26 mm inside diameter.